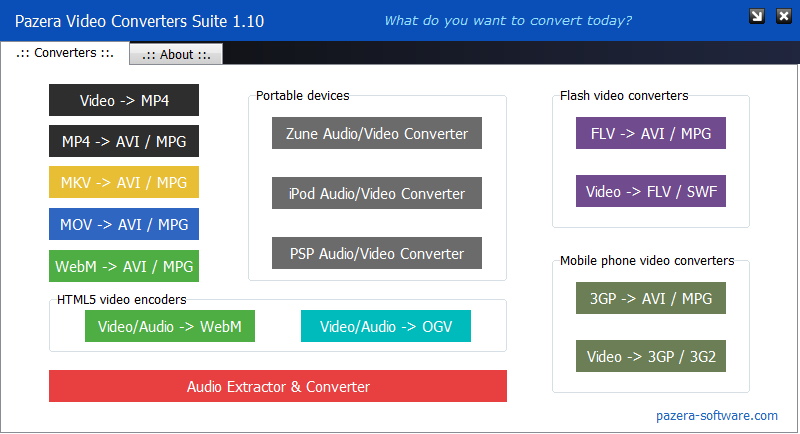 Pazera Video Converters Suite is a collection of free portable video and audio converters which helps you to convert between almost all video formats like AVI, MPEG, MP4, MOV, WMV, FLV, MKV, WebM, OGV, M4V, 3GP. In addition, the collection contains audio extractor & converter, which allows you to extract audio tracks from video files and convert audio files between the most important audio formats (MP3, WMA, OGG, WAV, AAC, AC3, FLAC, M4A). This software is copyrighted by Pazera Jacek company ("Producer") and is protected by copyright laws and international treaty provisions. This software is provided "as-is" and without warranty of any kind, express, implied or otherwise, including without limitation, any warranty of merchantability or fitness for a particular purpose. Permission is granted to anyone to use this software for any purpose, including commercial use, but this software can NOT be sold or modified without written permission of the Producer.